Please note: There will be an Extraordinary Meeting of the Finance & Good Governance Committee on 8 April 2019 (to follow immediately after the Planning Committee meeting scheduled for that date). Damage to the wooden train in the toddler area of Clear Crescent Playpark. Removal of benches in Orchard Road Cemetery and evidence that these are being used as a meeting place . Although the village wardens have taken steps to make good the damage to the play equipment, unfortunately further damage has been done. What can you do to help? If you notice any activity in either of these areas – or indeed any area of the village – that you believe to be unlawful to likely to cause harm or danger to others, please contact the police on 101 to report it. The police can only respond to incidents if they are made aware. Kier will be carrying out bridge joint repair works at the above location, on behalf of Highways England. They plan to complete this work over five nights, from Monday 28 January, with working hours of 8pm to 6am, weekdays only, weather permitting. A full closure of the M11 southbound between junctions 11, Westfield Interchange and junction 12, Haggis Farm Interchange, to repair bridges over the River Granta and Bourn Brook. A decision has been made to undertake maintenance work at both these locations to minimise future disruption. Diversion route : A clearly signed diversion route will be in place via the A603, A1198, A505 and A10. The diversion route is shown in the map below. ‘Please note that there is no green bin collection in Barrington, Chesterton Fen, Foxton, Melbourn, Meldreth and Shepreth on Tuesday 29 January as incorrectly printed in the magazine. These areas will just have a blue collection on this day. 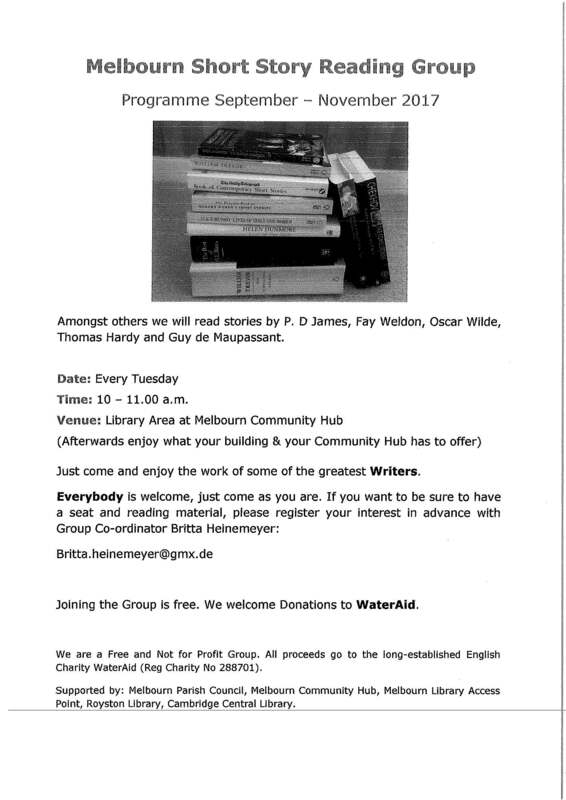 Come along to the next Melbourn Timebank coffee morning 16 January at The Hub. See poster for more dates in January and February. Wanted: Cleaner for village pavilion. Please contact Assistant to the Clerk for more information. Christmas Tree Recycling : Melbourn residents. You are invited to bring your Christmas tree down to the village car park on 7 and 8 January 2019 for recycling. A designated drop-off point will be clearly marked on these dates only. This initiative is supported by Herts & Cambs Ground Maintenance who will be in the car park during the morning on 9 January 2019 to shred trees. Please see attached information from Royal Mail regarding scam mail. You may have noticed large numbers of small bees in the grass to the rear of the play area at The Moor. These are harmless Ivy Bees – more information is available here. 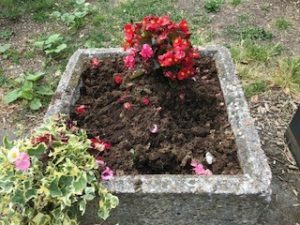 Thanks to the volunteers who gave their time and effort to plant the flower tubs in the centre of the village – they looked beautiful. Our grateful thanks too to James Cantle from Shire Trees for generously donating £50 to replenish the tubs after they were ‘harvested’ and left looking a little less lush! 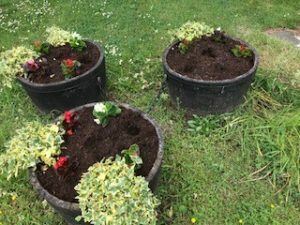 We hope the flower tubs are left undisturbed for the benefit of the whole village. Details of changes to No 26 bus service from 15 April 2018. 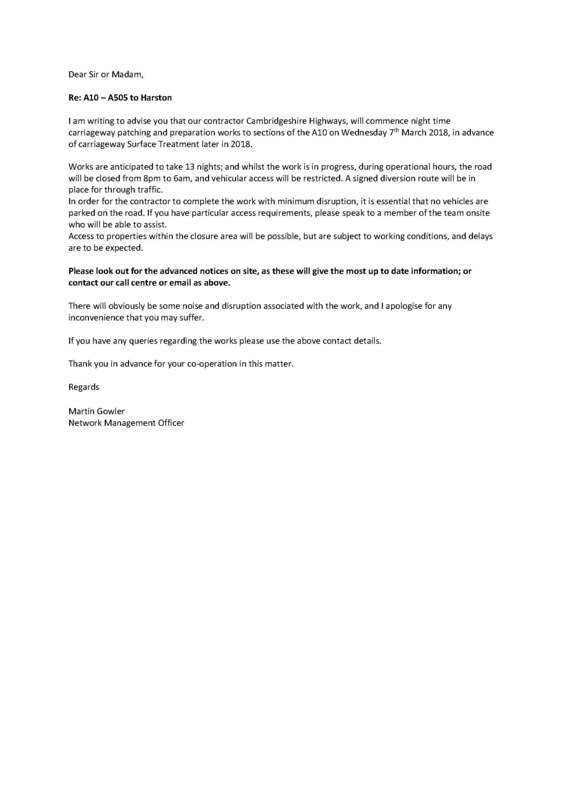 Please see information received from Cambridgeshire County Council relating to proposed road closures on the A10 between Royston and Harston. Further information will follow once this is received. We are currently working with our contractor Skanska, and their supply chain Eurovia, to establish the program for 2018. 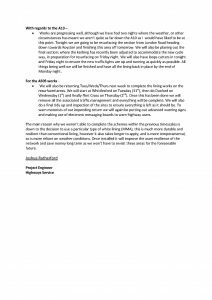 As there are five sections of the A10 between Royston and Harston that are due to receive this treatment, I felt that I should inform you of what is being planned. All works are currently planned for June 2018 although I have no dates as yet. Work will be carried out under restricted hours working, between 9.30am and 3.30pm, using Convoy Stop/Go Traffic Management. 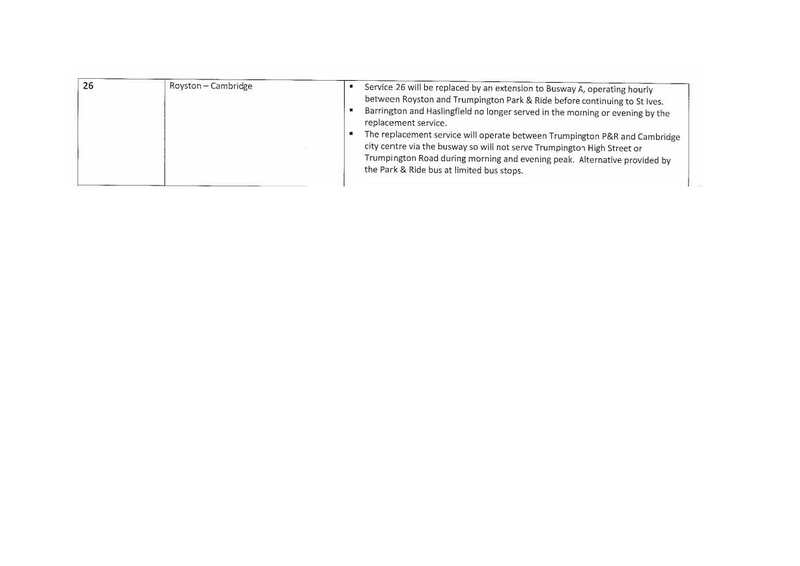 We are proposing to carry out the elements of work closer to the level crossing at Foxton, after 7pm. I would at this stage, point out that Surface Dressing cannot be carried out at night and is of course subject to weather. 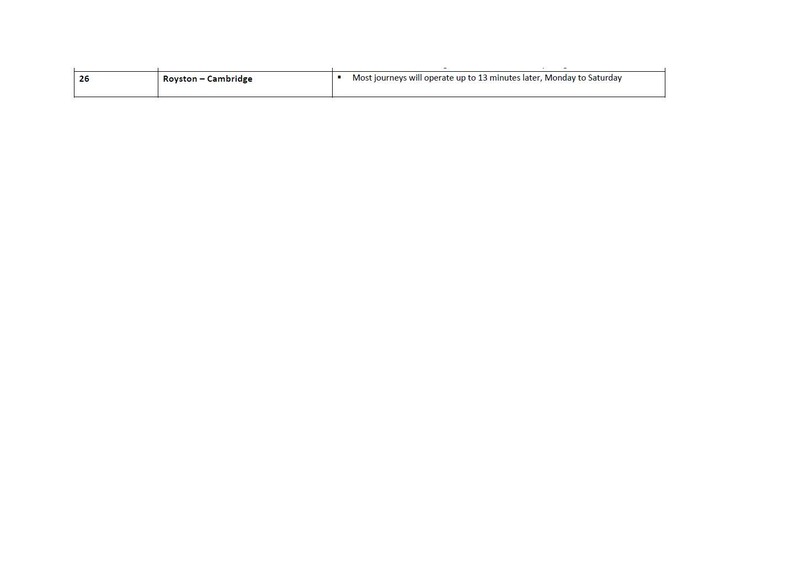 The largest section of work will be Melbourn Bypass between Cambridge Road and Royston Road. It is estimated that work along this section alone will take 5 days to complete. 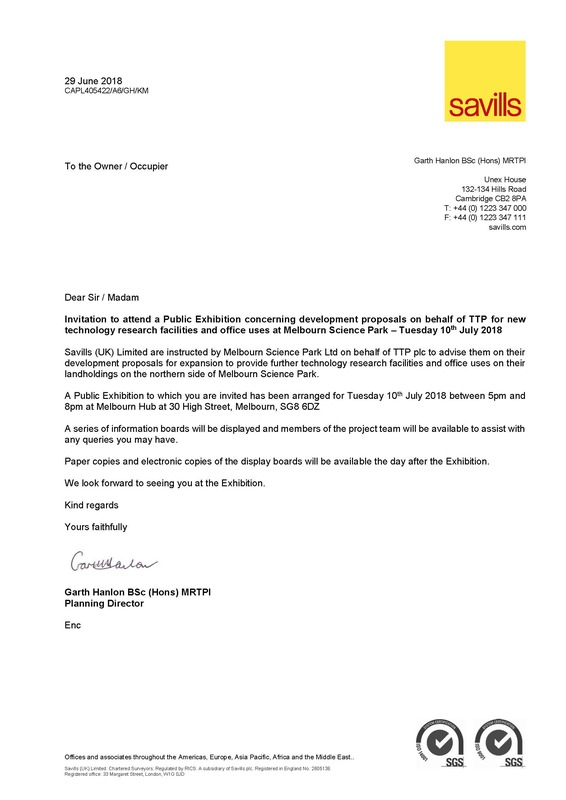 In order to reduce the timescale and inconvenience to businesses and the public; it has been proposed that perhaps this section could be done under a 7am to 6pm Saturday road closure. 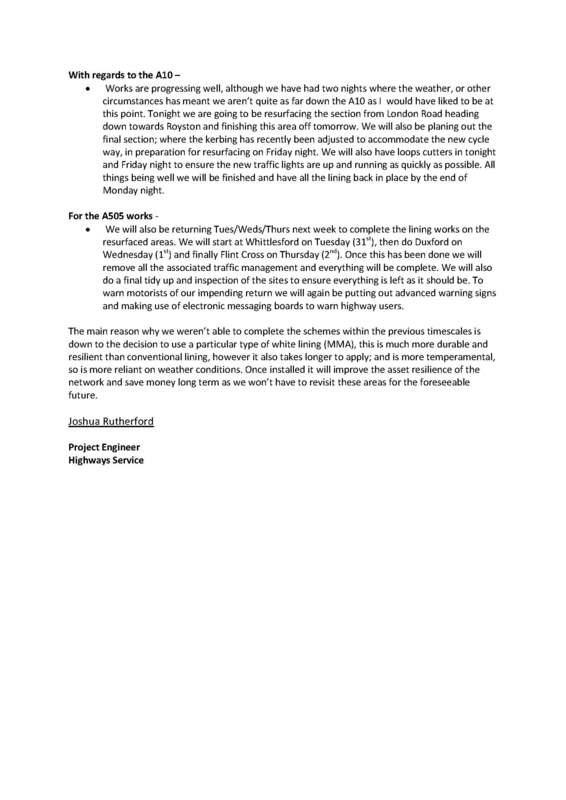 The contractor has stated that they are confident that under a full closure and with the weather on their side, the road could be treated in one day not five; with the Sunday being kept back as fall back in case the weather on Saturday prevented completion. However, in order to do this, the diverted traffic would have to be put through Melbourn village whilst the road is closed. 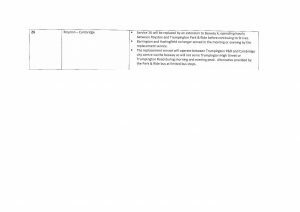 I have spoken to our Streetworks Permitting Manager, and although we both see the sense of this approach, especially as the village road was previously the A10 and is constructed accordingly, we felt that the idea should be put to you for your consideration and input. I would be grateful if you could let me know your thoughts. Should you wish to speak to me, my phone number is 07824529762. 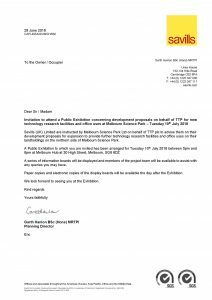 I do appreciate that putting the traffic through Melbourn will increase the traffic flow significantly for the period the road is closed, but by doing it at a weekend, we would hope to reduce the number of HGVs than if it was in a weekday. Also, one day of closure rather than 5 of queues might also be preferable for local residents? 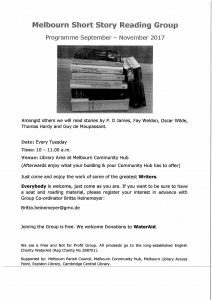 Something need doing in Melbourn? Is there something not working in Melbourn? A faulty streetlight? Grass too long in your local play park? 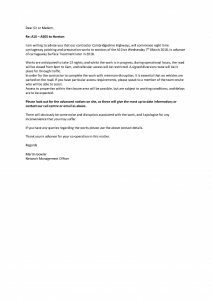 Please click here for details on who to contact. For Parish matters, please either call the Parish Office (01763 263303 #3) or email (notifications@melbournpc.co.uk). Alternatively, you may wish to complete a report form and send it in to the Parish Office – Notifications log sheet. Please provide as much information as possible to enable us to deal with matters efficiently. • We are reaching about 550 people on Facebook. • Getting in the region of 90 likes a week. 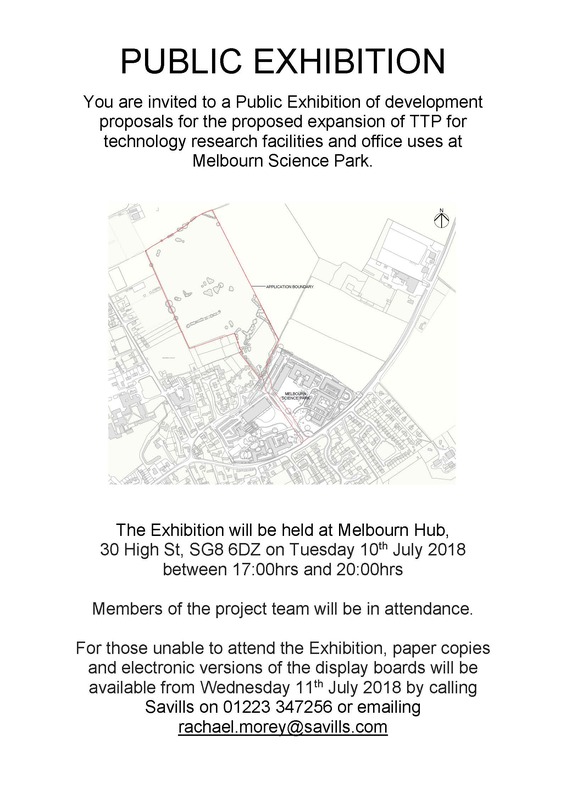 Message from County Cllr van de Ven: Please find attached draft minutes of the Cam Vale Bus Users Group held on 17 July, including updates on the proposed new post-16 student shuttle service connecting Bassingbourn and Whaddon to Meldreth Station, and uncertainty on the new contract for the 127/128 bus service affecting these and other villages – Cam Vale Bus Users Group July 17 minutes. Update on 127/128 bus service: Confirmation has now been received from the Traffic Commissioner that the 127/128 bus service will run with a new operator commencing July 31. The new operator is A2B Bus and Coach Ltd, and the new timetable is which is currently being printed, is attached – 127 128 timetable (option 1 – revised) . This means there will be no break in service. Please note that the 127/128 depends on council subsidy, for which there are no future guarantees, so there will be much work to do this year to ensure that this essential transport service continues. 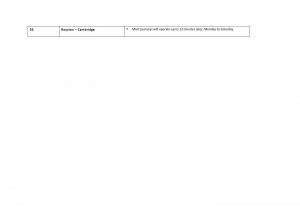 Flooding: If you are aware of areas of flooding in the village, please report this to Cambridgeshire County Council Highways via their online reporting system. If you are waiting in the village car park, please turn off your engine. This is a residential area and is also situated very close to the Primary School playing field. We are sure you understand that this request is made with the wellbeing of local residents (particularly children) in mind and especially following recent news reports of very high air pollution levels. A message from Chief Inspector James Sutherland, Area Commander, South Cambs with regard to village parking problems and recent media coverage about policing in villages. 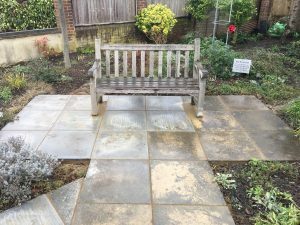 Melbourn Parish Council is now on facebook – https://www.facebook.com/MelbournVillage/ The page will be updated regularly with Parish Council news and information. 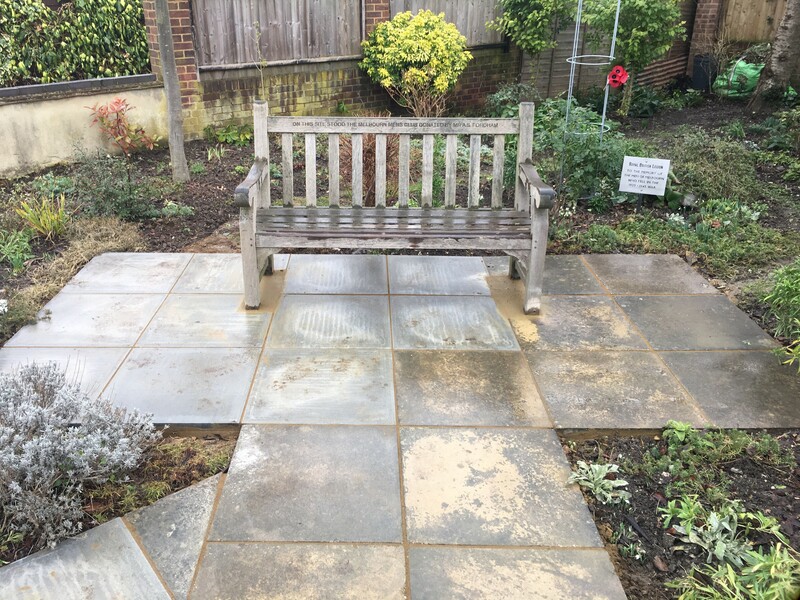 Our thanks go to Herts & Cambs Ground Maintenance and Norburys Building Supplies for the kind donation of their time and materials in carrying out essential repairs to the Memorial Garden at 83 High Street. Consolidated Definitive Map and Statement of Public Rights of Way in Cambridgeshire: Maps are available to view : Protecting unofficial paths map. 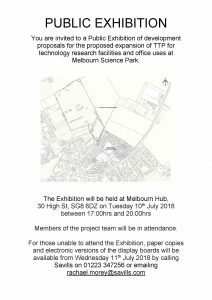 See also Definitive Statement for the Parish of Melbourn and 2016 09 15 Public Notice Consolidation. Council Agendas are available to view on line for all Committee and Full Council meetings. Note: These are placed online on the Wednesday prior to the meeting. Supporting documentation will be published on the website whenever possible. However, if this is not possible it will be available at the meeting. The planning application search system has been developed to offer a search facility for planning, listed building and advertisement applications made in the District. Click here to search for applications.